KUALA LUMPUR, Jan 7 (Bernama) — PKR President Datuk Seri Anwar Ibrahim reiterated that there is no issue between Prime Minister Tun Dr Mahathir Mohamad and him on the transition of the country’s number one post. 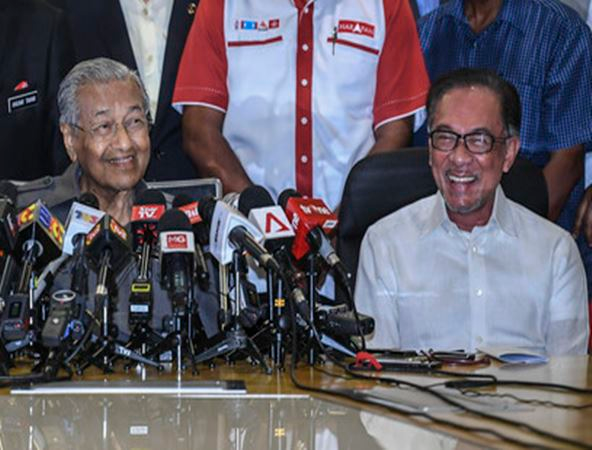 In a statement today, Anwar said that he recognised there was abundant speculation about his taking over from Dr Mahathir fed in part by inaccurate reports in mainstream and social media which created the perception of conflict among the leadership. “I would like to set the record straight and reiterate that there is no issue whatsoever between Tun (Dr Mahathir) and I on the transition. We have agreed on the process and succession plan and this matter is also resolved within Pakatan Harapan (PH),” he said. Anwar added that after his meeting with Dr Mahathir last Wednesday, he restated his consistent position that Dr Mahathir be given the space and support to lead the government. “The PH leadership must stay focused on the pressing issues of removing economic hardships of the people, institutional reform and bringing to justice those who robbed from the public purse. “I support Prime Minister Mahathir’s assertion that the PH government is strong. We are working diligently to fulfil our promises to the Malaysian people as a government which represents all people and rejects all forms of race baiting and incitement to hatred and violence,” said Anwar. He also pointed out that despite much has been accomplished, the challenges that lay ahead were formidable and would require teamwork and unity within PH. “We recognise there are forces which would like to see us fail. I urge the leadership to be on guard against these forces that would prefer to see a resurgence of rentier culture and their attempts at hoarding nation’s wealth at the expense of social justice and the welfare of the people,” he said.